As a 12-year-old, I used to obsessively watch Jonny Quest, an animated series about the adventures of a teenage boy and his scientist father. Out of all the episodes I must have watched all those years ago, scenes from one particular episode remains imprinted on my mind – the images of grey, monolithic heads protruding from a field of burnt grass. And it was these images that appeared, unbidden, as I pondered whether it would be worth the price tag or the hassle of dragging my family to the most isolated place on earth. 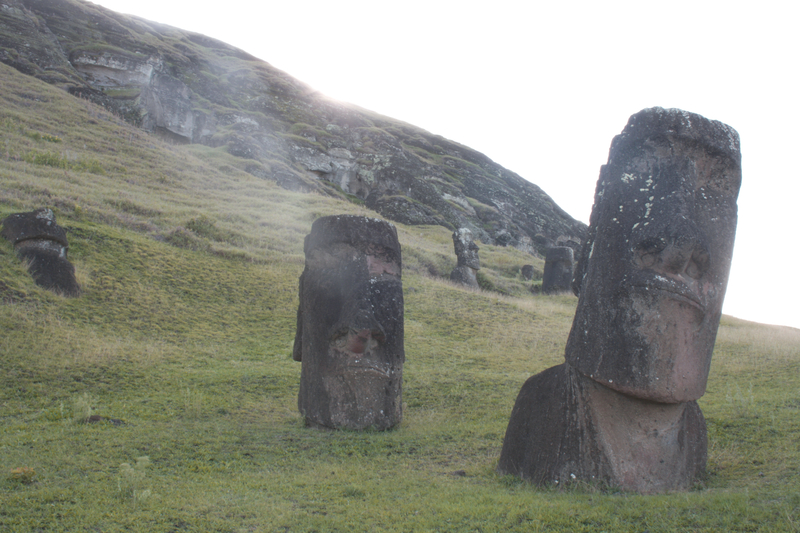 A month later, I found myself standing before the Moais of Easter Island. 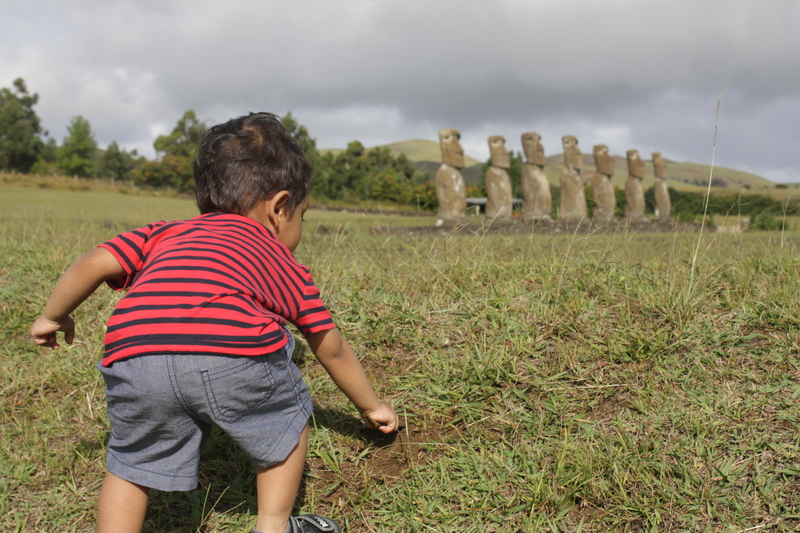 It was at Ahu Akivi where I first lay my eyes on the Moai. Before coming to this site, I had no concept of the ahu (ceremonial platform) or that each platform could host more than one Moai. 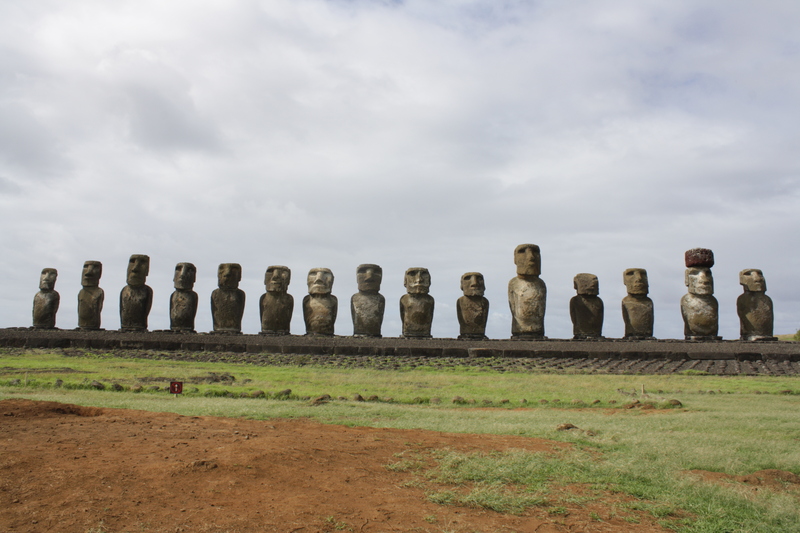 Seven Moai, of roughly the same size, stood on the platform, facing the ocean. 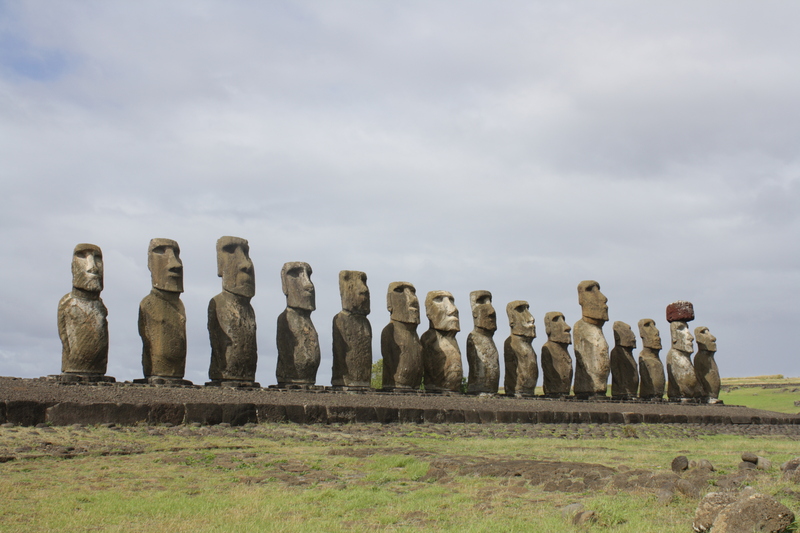 My ignorance didn’t allow me to spot the irregularity in this, but I soon learnt that all the Moai erected on the island looked inwards, away from the ocean, as if they were standing watch over the island. 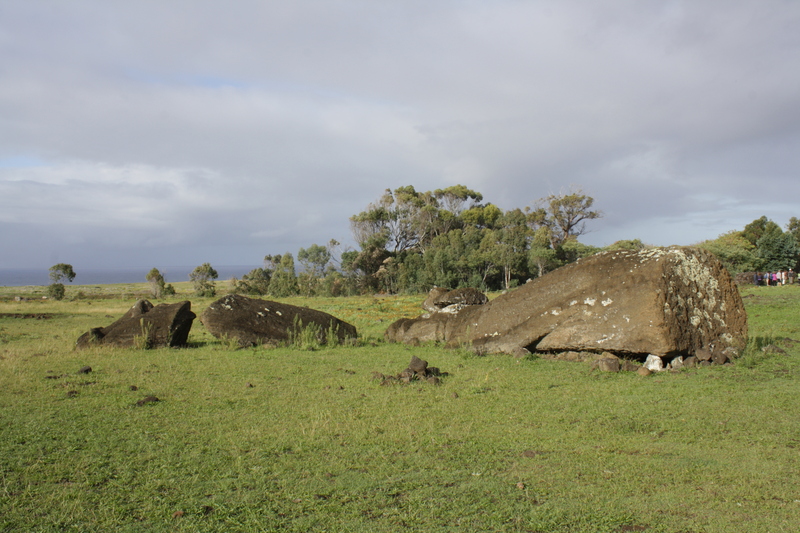 These Moai are also the only ones erected inland and is presumed to have acted as a celestial observatory. 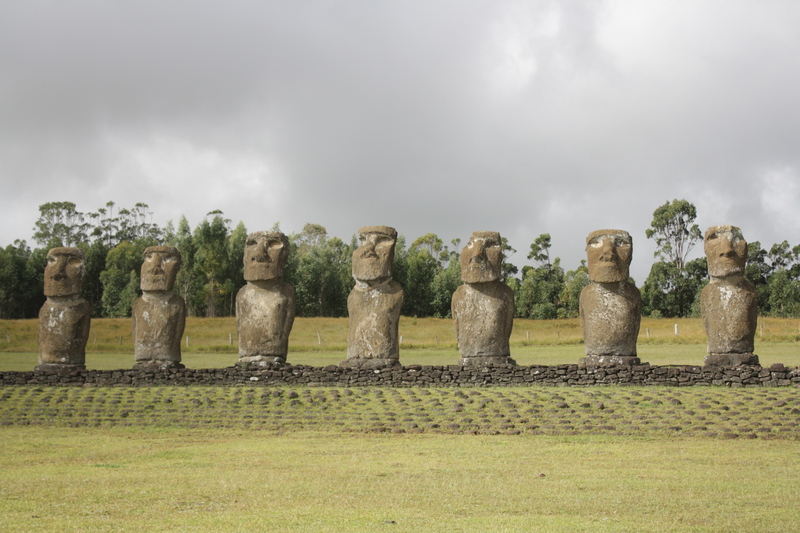 Ahu Tongariki, is the largest platform on the island with 15 Moai statues, in various shapes and sizes. It is here that I learnt about the Moai topknot. 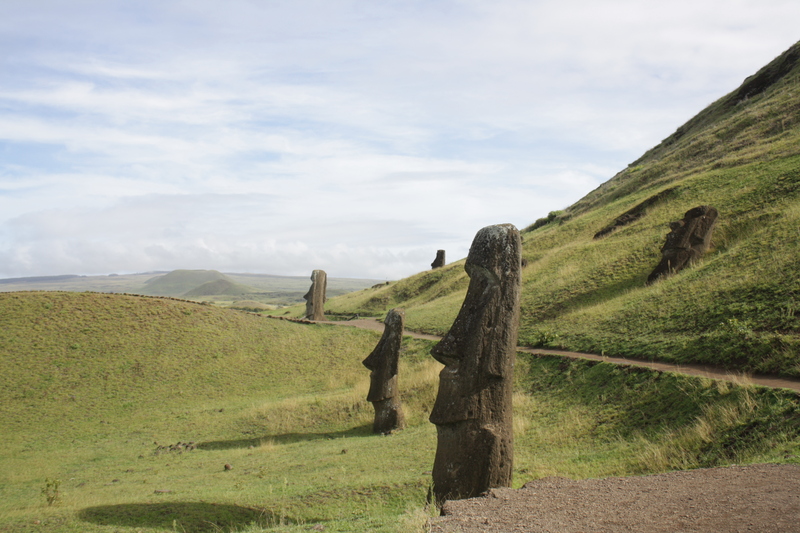 The Moai are thought to represent chieftains and other powerful men. It was customary for tribal chiefs to have a red topknot. One Moai at Ahu Tongariki sported a large rock on its head, meant to represent the topknot. Rano Raraku or the Moai ‘nursery’ as it is often dubbed, is the quarry from which all the Moai on the island had been carved. The outer slopes of this volcano is peppered with hundreds of Moai, in various stages of completion. It is also where those images, long imprinted on my mind, are from. I was brought back to reality as a small voice exclaimed besides me, “Look Mama! 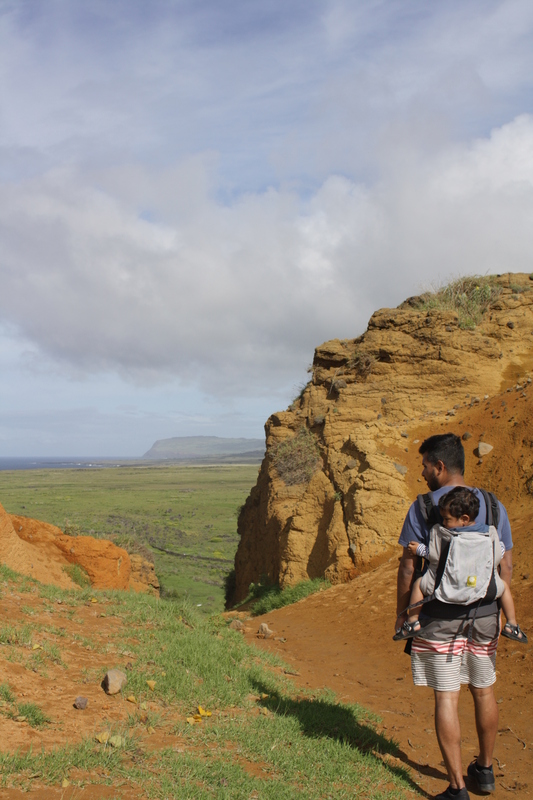 Mo-aai!” My son had conquered the trail to join me. The rest of the morning was spent meandering through grassy knolls and scrambling up trails, trying to spot some of the most remarkable Moai at Rano Raraku. The largest, 71 feet in length, lay prostrate and incomplete. It is presumed that it was too large to be carried out of the quarry, so the islanders gave up on it. Tukuturi is another statue that is an anomaly, as the only statue that is seen squatting, with its hands on its thighs, presumably in prayer or as part of a musical ritual.